Izzie’s is participating The Seasons Story, offering a Metallic Lunar Tattoo. The tattoo includes appliers for Maitreya, Belleza, Slink and Omega, system tattoo layers are included as well. It applies to upper and lower body, hands and feet. The tattoo is materials enabled for mesh bodies (specular and normal), that means you will see shine and structure on the tattoo depending on your mesh body, light source, graphics and mesh body settings (an instruction NC is included how to make materials visible for each body). The Metallic Lunar Tattoo comes in 8 colors and will work for light – dark skintones, however it may not work for all skintones and bodies, so please try a free DEMO before purchasing! 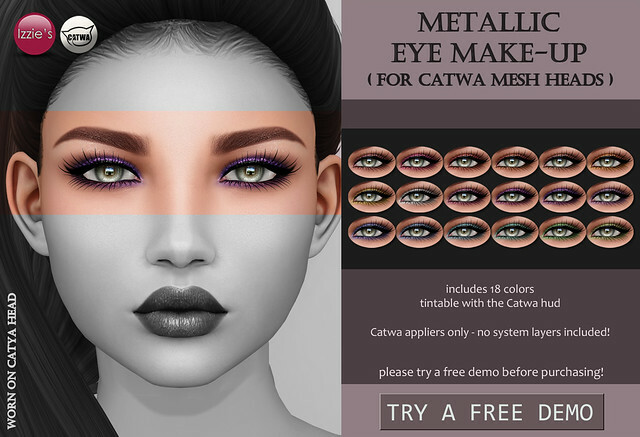 Izzie’s is offering Metallic Eye Make-Up and Lipstick sets with lots of colors to choose from for Catwa and LeLutka mesh heads at the TLC “Romantically Metallic” round. It is possible to buy full sets (eye make-up and lipsticks in 1 set) or each set separately. Please try a free demo before purchasing! Izzie’s released Dark Metallic Eyeshadows Appliers in 15 colors for Catwa mesh heads at Izzie’s mainstore and on Marketplace. Those are based on the older Dark Metallic Eyeshadows for my Romy Skin (system tattoo layers) which you can get at the mainstore as well. Please try a free demo before purchasing to make sure they will work for your head/skin! Izzie’s is offering a special pink/purple edition of the Metallic Arrow Tattoo at TDR Fusion (new round starts Sunday September 13). The tattoo will work for light – dark skintones. It attaches to upper body, lower body and head. There are system tattoo layers for classic avatars included as well as appliers for Slink Physique and Maitreya Lara mesh bodies, Slink Visage and LeLutka mesh heads. Izzie’s released 2 new sets of prim nails, Classic Nails and Metallic Nails. They are made for hand sizes 10, 15 and 20 with built-in relaxed hand pose. You can change the texture via HUD (choose from 40 colors) and there are also tintable nail bases on gloves layers included (13 skin tones). You’ll find the nails at the skin section of Izzie’s mainstore (use the teleporter at the entrance).